sorry I haven't been posting a lot lately! I've been pretty busy with exams and all, but I'm almost done now. I've also been working quite a lot on my other blog lately, designing clothes and furnishings and stuff like that. I'm going to upload photos of everything on beautiful garbage soon, but the blog is still not finished so maybe you just wait a week or two and have a look at it then, haha. the title of this post is a line from dani california by rhcp, one of my favourite songs for the summer. it kind of inspired me to create this outfit. I told you about this shirt in my other post, it's from a coney island gift shop and I've cropped the sleeves and neckline of and dyed it black, I really love it! coney island always reminds me of my favourite book just kids by patti smith and the song coney island baby by lou reed, and the logo looks kind of retro-ish and a little scary, which I love! and this is the look! 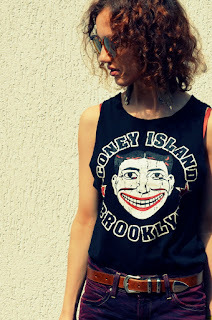 please check out and hype me on lookbook if you like my looks, I'd really appreciate it a lot!